We’d love your help. 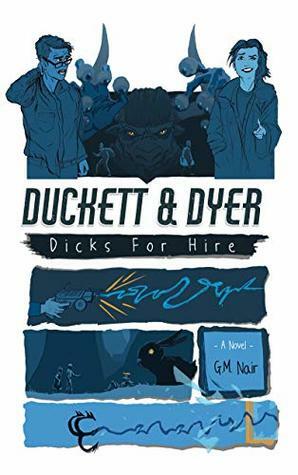 Let us know what’s wrong with this preview of Duckett & Dyer by G.M. Nair. Michael Duckett is fed up with his life. His job is a drag, and his roommate and best friend of twenty years, Stephanie Dyer, is only making him more anxious with her lazy irresponsibility. Things continue to escalate when they face the threat of imminent eviction from their palatial 5th floor walk-up and find that someone has been plastering ads all over the city for thei Michael Duckett is fed up with his life. His job is a drag, and his roommate and best friend of twenty years, Stephanie Dyer, is only making him more anxious with her lazy irresponsibility. Things continue to escalate when they face the threat of imminent eviction from their palatial 5th floor walk-up and find that someone has been plastering ads all over the city for their Detective Agency. The only problem is: He and Stephanie don’t have one of those. To ask other readers questions about Duckett & Dyer, please sign up. That ghost-writer I hired did a pretty good job, but I wish he hadn't been drunk the whole time. Also, I wish he wasn't a real-life ghost. Very easy read, full of laughs, suspense, and everything needed for a invigorating sci fi mystery story. Could not stop reading. There is something really unique here that no one is publishing in the genre, a hilarious tale that has heart and science and world-building. Reminiscent of Douglas Adams, definitely a new author with lots of potential! I picked this gem of a book as part of Indie April and boy, I'm so glad I did. The plot is endearing and hilarious. The protagonists Stephanie and 'Mike-ster' are wonderfully written and they'll stay with you after the book is done. The author has a confident voice and his writing is impeccable which doesn't make the book read quite like it's a debut novel. Would definitely recommend for lovers of humour and science fiction. A masterfully woven tale with a mix of mystery, drama, and comedy that will always leave you eager to get to the next page. It's easy to read and get into, but has a deep story that will keep you thinking and leave you wanting more.